I was introduced to Grandmaster Doc-Fai Wong back in 1972. At that time he was known as Sifu and was teaching Choy Li Fut in the garage of his house. We were about the same age but that?s where any similarity ended, he was married I was single, he had a daughter of about 2 years old and I had a dog, he was very skilled in the martial arts and focused and I was a vagabond with a wanderlust for travel. Somehow through all this difference we became good friends. During this time until 1974 I learned a lot about Choy Li Fut and martial arts; I attended his classes 40 hours a week. I helped open his school in the Sunset District, one of the first of its kind I believe. All the students now had a place where they could go to learn this (to most) ?new? system. I went to the Community College with Grandmaster and witnessed his marvelous skill as a teacher of all kinds of people. I went to see my first tournament and had many other great experiences. 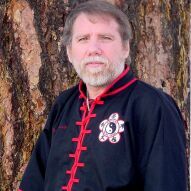 During all this Grandmaster instilled a love for the martial arts that has always stayed in me. I had not yet seen a martial arts movie. In 1974 I immigrated to Australia. It was hard for me to leave but this was an opportunity I couldn?t miss, however, Grandmaster gave me some good instruction on what to look for in another teacher. It took awhile but I eventually found my next teacher of karate and worked with him for several years before moving to different parts of Australia. I also met another person who introduced me to Tai Chi and I worked with him for a few months. In 1986 I returned to America, now with my wife and two children. Eventually we ended up in the little town of Goldendale, Washington. I started teaching what I knew and one day, while on the computer, I typed in the name Doc-Fai Wong to see if I could find my old friend and teacher. It was amazing what came up! Here he was still in San Francisco, still teaching and had expanded to worldwide influence. I felt really great to see he had done so well. Feeling very nervous I sent him a message and he responded! He said mine was one of the first messages since starting the website. He even remembered me. I scraped together what money I could and with great apprehension as well as my wife?s blessing, traveled to San Francisco to see Grandmaster again. As soon as I saw him sitting in his office I felt I had come home, a very strange feeling. Grandmaster welcomed me back, and then proceeded to teach me Tai Chi and whatever else he could get in my thick head. During one trip I worked on his new school to be opened in Sausalito, it was like history repeating again but with greater pleasure. His son, Sifu Jason who wasn?t born yet when I left was a grown man and an excellent martial artist. His daughter Corinna was all grown up. Simo (Grandmaster's wife), who didn?t know me in the early days, is a delight to be with. All are very patient with my country-bumpkin ways. It is certainly an honor and privilege to be a student and friend of Grandmaster Wong.